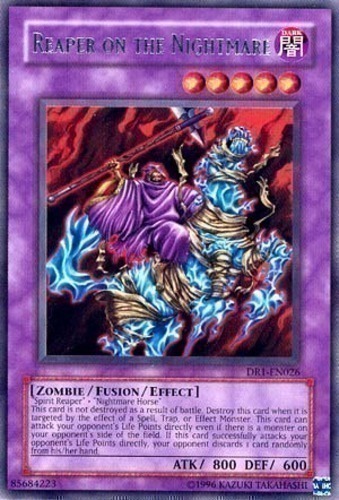 "Spirit Reaper" + "Nightmare Horse"
This card is not destroyed as a result of battle. Destroy this card when it is targeted by the effect of a Spell, Trap or Effect Monster. This card can attack your opponent's Life Points directly even if there is a monster on your opponent's side of the field. If this card successfully attacks your opponent's Life Points directly, your opponent discards 1 card randomly from his/her hand.